DHW Production DHW (Domestic Hot Water) is potable water for uses other than space heat. 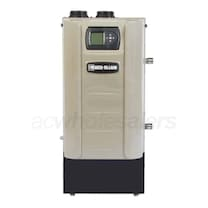 Some boilers are able to provide DHW "out of the box", while others can do so with the purchase of optional accessories. 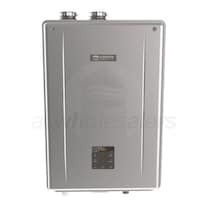 Wall Mounted, Condensing Combi Boiler with Modulating Gas Valve. Ships Packaged. Ratings: 80K BTU Gross Input, 73K BTU DOE Capacity, 63K BTU Net IBR Capacity. Includes Circulator. 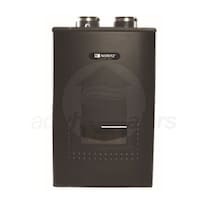 Wall Mounted, Condensing Combi Boiler with Modulating Gas Valve. Ships Packaged. Ratings: 100K BTU Gross Input, 92K BTU DOE Capacity, 80K BTU Net IBR Capacity. Includes Circulator. 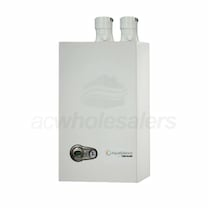 Wall Mounted, Condensing Combi Boiler with Modulating Gas Valve. Ships Packaged. Ratings: 120K BTU Gross Input, 109K BTU DOE Capacity, 95K BTU Net IBR Capacity. Includes Circulator. 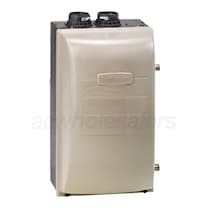 Wall Mounted, Condensing Combi Boiler with Modulating Gas Valve. Ships Packaged. Ratings: 155K BTU Gross Input, 144K BTU DOE Capacity, 125K BTU Net IBR Capacity. Includes Circulator. 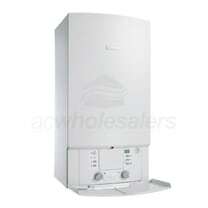 Wall Mounted, Condensing Combi Boiler with Modulating Gas Valve. Ships Packaged. Ratings: 120K BTU Gross Input, 112K BTU DOE Capacity, 97K BTU Net IBR Capacity. Includes Circulator. Wall Mounted, Condensing Boiler with Modulating Gas Valve. Ships Packaged. Ratings: 101K BTU Gross Input, 89K BTU DOE Capacity, 79K BTU Net IBR Capacity. Includes Circulator. Wall Mounted, Condensing Boiler with Modulating Gas Valve. Ships Packaged. Ratings: 132K BTU Gross Input, 117K BTU DOE Capacity, 103K BTU Net IBR Capacity. Includes Circulator. Wall Mounted, Condensing Boiler with Modulating Gas Valve. Ships Packaged. Ratings: 110K BTU Gross Input, 101K BTU DOE Capacity, 88K BTU Net IBR Capacity. Floor Mounted, Condensing Boiler with Modulating Gas Valve. Ships Packaged. Ratings: 399K BTU Gross Input, 365K BTU DOE Capacity, 317K BTU Net IBR Capacity. Includes Circulator. 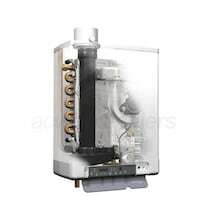 Wall Mounted, Condensing Combi Boiler with Modulating Gas Valve. Ships Packaged. Ratings: 120K BTU Gross Input, 111K BTU DOE Capacity, 97K BTU Net IBR Capacity. Includes Circulator. Wall Mounted, Condensing Boiler with Modulating Gas Valve. Ships Packaged. Ratings: 152K BTU Gross Input, 134K BTU DOE Capacity, 117K BTU Net IBR Capacity. Includes Circulator. Wall Mounted, Condensing Boiler with Modulating Gas Valve. Ships Packaged. Ratings: 110K BTU Gross Input, 101K BTU DOE Capacity, 88K BTU Net IBR Capacity. Includes Circulator. Floor/Wall Mounted, Condensing Boiler with Modulating Gas Valve. Ships Packaged. Ratings: 220K BTU Gross Input, 206K BTU DOE Capacity, 179K BTU Net IBR Capacity. Includes Circulator. Floor/Wall Mounted, Condensing Boiler with Modulating Gas Valve. Ships Packaged. Ratings: 399K BTU Gross Input, 383K BTU DOE Capacity, 333K BTU Net IBR Capacity. Includes Circulator. Floor Mounted, Condensing Boiler with Modulating Gas Valve. Ships Packaged. Ratings: 230K BTU Gross Input, 207K BTU DOE Capacity, 183K BTU Net IBR Capacity. Includes Circulator. Wall Mounted, Condensing Boiler with Modulating Gas Valve. Ships Packaged. Ratings: 110K BTU Gross Input, 102K BTU DOE Capacity, 89K BTU Net IBR Capacity. Includes Circulator. Wall Mounted, Condensing Boiler with Modulating Gas Valve. Ships Packaged. Ratings: 153K BTU Gross Input, 142K BTU DOE Capacity, 123K BTU Net IBR Capacity. Includes Circulator. Floor/Wall Mounted, Condensing Boiler with Modulating Gas Valve. Ships Packaged. Ratings: 70K BTU Gross Input, 65K BTU DOE Capacity, 57K BTU Net IBR Capacity. Includes Circulator. Floor/Wall Mounted, Condensing Boiler with Modulating Gas Valve. Ships Packaged. Ratings: 110K BTU Gross Input, 101K BTU DOE Capacity, 88K BTU Net IBR Capacity. Includes Circulator. Wall Mounted, Condensing Boiler with Modulating Gas Valve. Ships Packaged. Ratings: 106K BTU Gross Input, 94K BTU DOE Capacity, 82K BTU Net IBR Capacity. Includes Circulator. 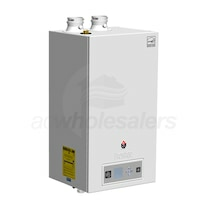 AC Wholesalers offers a huge selection of Modulating Boilers online at wholesale prices. 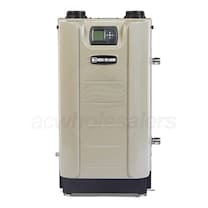 Find the best Modulating Boiler System deals that fit your budget by comparing our full range of Modulating Boiler models, specs, and cost. 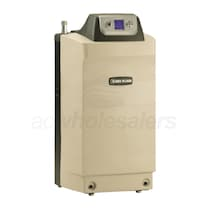 Read customer and experts ratings on Modulating Boiler Units to find out what other customer have to say about our products and services. 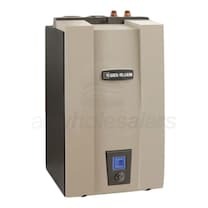 Our in-house Modulating Boiler Unit experts are here to help you purchase a Home Modulating Boiler at the lowest price possible, with free shipping available on all orders over $199. For your Modulating Boiler installation needs we offer a full network of preferred installers.